Oh, I’d rather not. Too uncomfortable. Too painful. I am unable, or at least unwilling. 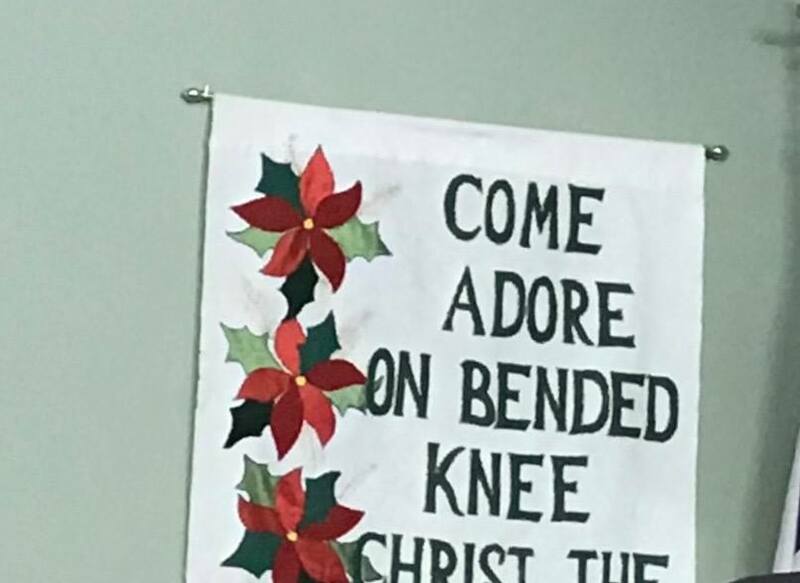 The bent knee at the revelation of the Advent Messiah — it is something of a spiritual watershed in scripture and humanity. In my Advent sermon text that day in Daniel chpt 2, pagan king Nebuchadnezzar falls down on his knees at the true revelation of God in his dreams and their meaning. 600 years later another intruder king, Herod, does no such thing at the revelation of Messiah. In Matthew 2, magi (perhaps progeny of Daniel’s influence) come to the cradle to bow down on their knees in worship, presenting themselves and their gifts to Him. But the magi of Daniel 2 by contrast are blind to see, and stiff to bend. Bent Knees are the universal gesture of helplessness, surrender, subservience – the acknowledged condition of being under, less than < the One bowed before; a pledge of allegiance. In the realm of faith, bent knees are like a ‘physical confession of faith’. We declare our helpless surrender and our trust. We bend our knees in prayer, in worship. But what about when we feel unable or disinclined to bend our knees?! In stubbornness, pride, fear, rigidity? What when the clear diagnosis of our condition is “Chronic Spiritual Arthritic Unbelief”?!? What when we find ourselves with the Christ right before us, and we are… utterly unbending? There is something within us resistant to kneeling. We lack the flexion, and sometimes it seems we stiffen even more with age. On this same trip to Grand Rapids I spoke on the phone with my brother. Of similar constitution, I tend to get his maladies a couple years after him. And, his knees are both recently retreaded. Forecasting my rehab from his experience, he’s assured me he’s glad he went through the surgeries, but he said one thing lingers. “It’s hard to get down on my knees; it feels odd, alien.” Yeah. Figures. So how to bend the knee when it is our natural arthritic and compensating resistance to not do so?! These 12 days of Christmas and beyond: how do we come to ‘feel’ like bending the knees, when the knees (and heart) don’t feel like bending?! It’s a pickle of irony: what to do when you’re helpless to make yourself helpless?!?! We see the great apostle bowing on his knees as he reflects on “the eternal purpose of God in Christ Jesus our Lord, in whom we have boldness and access with confidence through our faith in him…” (Ephesians 3:11-12). He says, “For this reason I bow my knees before the Father, from whom every family in heaven and on earth is named” (vv 14-15) And then, from his knees, he prays that his spiritual brothers and sisters will know the same spiritual strength that courses through his being. But he does not tell them to “kneel or else!” (even though it IS true that one day “every knee will bow…”). He doesn’t lecture them to try harder, nor does he coerce nor guilt nor threaten in order to gain compliance, submission. …of the Love of Jesus — for them. What I am pointing to is it seems the secret of the apostle’s bent knee is neither a result of effort nor compulsion. But, it is of contemplation and rest. It is the eye turned on Him, rather than the unhappy restless eye turned within, that with ease bends one low in grateful faith. The secret is in the tendons of the bird’s legs. They are created so that when the leg bends at the knee, the claws contract and involuntarily grip tight. The bird’s feet will not let go until the knees unbend again. So it is with us! We rest fully secure on bent knees!! Blessed Christmas Day, my co-arthritic sisters and brothers! In the days following I hope to post a “year in review” for your perusal and blessing. But tonight, I bend my knees before our Father whose Name binds us as family. I am praying that you would freshly in this season and beyond, see and bask in the vast, immense, immeasurable, limitless Love of Christ for you. And, in trusting response bend your knees in worshipful Rest.